Spring has come, bloomed, and almost gone around here…at least as far as the showy display of azaleas is concerned. In April we’ve see-sawed between highs in the 80’s and 50’s to lows in the 30’s…and the 70’s! With our last cold snap most likely behind us, it’s time to lighten things up a bit, and I’ve found the perfect way to do it. This very quick and easy soup is so delicate and delicious that you may even forget it’s ridiculously healthy, too. Tomatoes and oranges happen to love each other, and when you combine those flavors with the sweet undertones of anise in the tarragon, it’s a perfect trifecta for the happiest of soup marriages. The resulting taste is so fresh and lighthearted, filled with all the promise of Spring and Summer, and it’s quite a versatile recipe, too. You can actually make this any time by using minimally processed and no-salt canned tomatoes, some dried tarragon and fresh orange. Or, you can make it in the summer months with freshly grown tarragon and those prized homegrown tomatoes…I just can’t wait for that time to come! Use some store-bought stock, or homemade if you have it…either vegetable or chicken stock will work just fine. Make this and eat it hot or cold. Puree it and then go for it, or strain it after the puree and add some enrichments to make it creamy and velvety! The base recipe I’m showing you today is actually vegan, and you can decide if you want to fuss with and add to it, but we really enjoyed this “as is,” both hot and cold. Serve it by itself or with an accompaniment. No matter how you choose to enjoy it, it’s a lovely way to welcome the warmer weather with the lighter meals and fresh ingredients we so look forward to. Happy days. And just for fun, here is a peek at my Camellia Japonica Colonel Fiery in all its blooming glory. He (or she as the case may be), is blooming long and late this year, and has been in continuous bloom for many weeks now. I’ll show you more of my garden—including the azaleas you see in my new header—in my next post, but meanwhile…happy eating and Happy Spring! Heat the olive oil in a large stock pot or soup pot over medium heat. Add the onion and the garlic and saute until the onion is tender and translucent, about 3-4 minutes. Add the crushed tomatoes and puree, canned tomatoes with juice, tomato paste, vegetable stock or broth, juice and zest of the orange, tarragon, and 1/2 teaspoon of salt and pepper, and stir well. Bring the soup to a boil, then reduce the heat to low and cook for 35 to 40 minutes, stirring occasionally. Remove the pot from the heat and puree the soup in the pot with an immersion blender until smooth, or in batches in an upright blender. Season the soup to taste with a bit more salt and some pepper if desired. Serve this hot or cold, garnishing with a thin orange slice and a stem of fresh tarragon if you like. It will keep in the fridge for several days, and like most soups, is arguably better the next day. At this point you have a very delicately flavored and super tasty vegan soup. If you want, you can strain the soup through a fine mesh sieve to remove any solids and obtain a silky smooth texture. You can also add enrichments to make this a cream soup with or without straining it by returning the pot of soup to low heat and stirring in 1/2- 3/4 cup of half and half or cream, or to taste, heating the soup until it is completely warmed through. I have also stirred a tiny bit of half and half or cream into a serving of this soup cold, and it was excellent! This entry was posted in Food, Soups and tagged Camelia Japonica Colonel Fiery, easy soups, Light Soups, oranges, tarragon, Tomato Soup, Tomatoes, Vegan, Vegetarian by bitsandbreadcrumbs. Bookmark the permalink. I love the list of ingredients for your soup. I think I have everything I need to make this next week when I get back into town. Your camellia is stunning. I can’t wait to see more of your garden. Have a wonderful weekend! Thank you so much, and I think you’ll love this soup…but let me know! That camellia is amazing. It must have had 100 blooms on it this year and it’s not that big! 🙂 Hope you have a great weekend, too, and safe travels. Love your new header photo and your soup…yum. Happy Spring Betsy. I love your new springy blog cover and this soup is delicate and a taste of spring in every bite. Hi Bam, and thank you for your kind words. I’ve had so many work deadlines lately that it was tough getting a new header done…I almost missed my own azaleas! I need to scoot over to Hong Kong and see what you’ve been up to. Happy weekend! Thank you Charlie Louie, I’m so glad you like the soup. 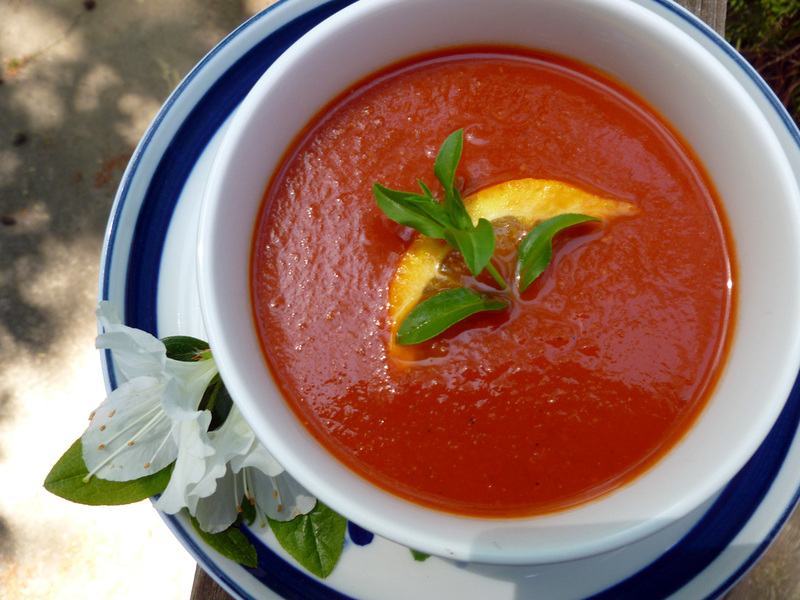 It is really amazing how well the tomato goes with the orange in this soup. It’s really wonderful. I’m glad I got some shots of the garden before they were gone. Thanks for stopping by. I’ve been so behind on my reading that I’m surprised I still have any commenters left! Hope your vacation was fun and I shall go and see what has transpired this past week. Happy weekend! Gorgeous soup and I think tinned tomatoes really taste so good when it’s not tomato season. 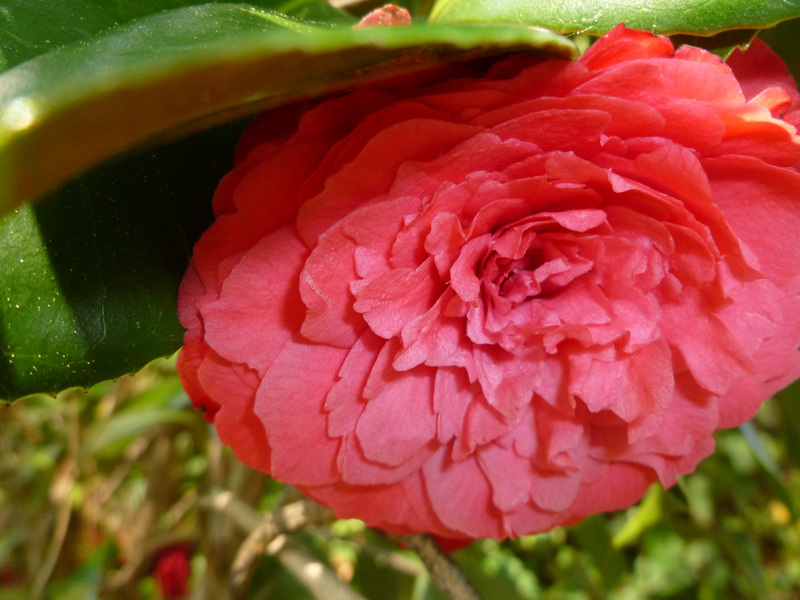 Beautiful camelia too – our neighbour has one and I always eye it enviously! Actually I do like no-salt tinned tomatoes…they work so well for soup and sauce and save a ton of time…even IF you have fresh on hand, which I like to enjoy in other ways since I can’t grow them! 🙂 This camellia has been spectacular, and I wish it had been in full bloom all at once so I could have shown it. Have a great weekend, Tanya! Thanks for sharing both, your recipe and garden, Betsy. Thank you, John. Usually this whole camellia plant is quite a show, as well as the showy double blossoms. But this year it has bloomed and bloomed at not all at once so many blossoms are spent and on the ground when others like this one are just opened up. Weird Spring. 🙂 I would love to hear what you think of the tomato/orange/tarragon combo, John. It does sound strange and tastes great…at least to us. I have my garden and a garden tour in Alabama to share. it was fleeting but beautiful and now we are all green here, awaiting our summer blooms. Hope your Spring comes soon and lingers long! Oh my goodness! If you like this soup, try oranges in a black bean soup. I need to perfect that idea myself, but have had it in a Cuban styled soup and it was wonderful. Oranges are far more versatile in savory dishes than one might think…or at least I think so! Thank you Sawsan, and let me know how you like these soups when you try them. I love your sense of taste and it would mean a lot! Just the perfect soup and I’m so intrigued with the flavour pairing, I can hardly wait to try it. Spring is taking her sweet time here, azaleas haven’t bloomed yet, but it’s looking more promising each day. I think the lilacs, cherry blossoms and azaleas will all come at the same time this year. At least they are still coming. That’s kind of what happened here. When the blooms started, it was all the trees and shrubs at once instead of staggered like it usually is! I hope you’ll take some pictures of your spring up there…would love to see! Thanks Betsy, I hope you’ll post a few pics too. You’re most welcome for the idea, Cecilia, and I hope you enjoy the combo of flavors…it’s really refreshing! Wonderful flavours there, I don’t use Tarragon enough, I really should make more of an effort! Love the azaleas in the header!! Spring has truly arrived for all of us and what a simplistically lovely soup to enjoy the season with. Thank you, Jed, and I’m glad you like the azaleas. They were so pretty, if fleeting, this year. I have a feeling I’ll be making this soup pretty often, it’s so handy to have for lunch and it keeps so well. Hope you’re having a great weekend! I’m captivated by the sounds of this Betsy! And what a good looking soup too! 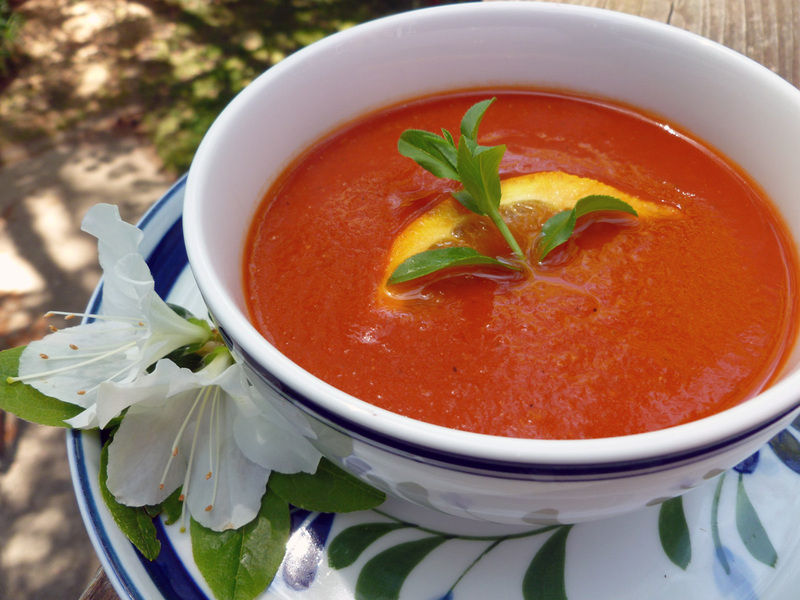 I had no idea that tomatoes and oranges had an affinity for one another, but I do love tomatoes and tarragon together and this soup is now on my list of must eats! Thanks Betsy! Hello Spree! I know it does seem strange to pair tomatoes and oranges, and yet no one thinks twice about limes and tomatoes or lemons and tomatoes. The orange brings out the sweetness in the tomato and the tarragon rounds them both out in this eatable hot and cold and drinkable little soup. Hope you do give it a try! 🙂 And thank YOU! I don’t think this would be one for my wife (she still hasn’t forgiven me for when I made orange chicken… she thinks orange doesn’t belong in savoury meals) but I have no such qualms. I’d enjoy this I think – it looks lovely and rich too. I was going to say, I agree with your last bit – serving it cold I think would be excellent. That would really make it very enjoyable on a hot day! Gosh, I can’t believe your wife has such a loathing of orange with savory dishes…a shame, but then we all have our likes and dislikes…that’s what makes us who we are! 🙂 Well I hope you get to try this sometime Charles. It’s lovely and light, and we’ve decided that cold is best, even just drinking it from a wee cup! Temperatures here had been going up and down too. Are we in the same area? Anyway, I just planted some tomato seeds and can’t wait to try your recipe with some fresh tomatoes. Looks luscious and so beautiful! I would definitely eat this as-is with no more fuss than the recipe calls for. Beautiful flower as well Betsy! I LOVE a good soup, and this would be perfect for a dinner date or even a get together with family. I’m not a huge fan of tarragon but the combo of tomato and orange is intriguing. Do you suppose basil might work? Hi there! The tarragon flavor is really subtle in this soup, so you might not find it unappealing. We know that tomatoes love basil, but I don’t think I’ve tried basil with orange, actually. However, I think a little basil might work, so I would say you can give it a try. You might also try some fresh flat leaf parsley or possibly cilantro in lieu of the tarragon. Love the color of your soup, so vibrant, looking forward to home grown tomatoes but first I must wait for the grounds to warm up so I can put the plants in the garden. Gorgeous camellia. Love your new header and looking forward to seeing more of your garden. Thank you, Karista! I hope you had a Happy Mother’s day with your little chicks…the human ones! 🙂 Happy Wednesday to you, too.